Speaking as an Irish MMA fan, Christmas came early for us in 2015 with UFC 194 on Saturday, December 12th and the long awaited match-up of long time unbeaten World Featherweight Champion José Aldo Junior and Interim titleholder Conor McGregor. So I replaced the traditional 24 day Advent Calendar with this online 12 day McEvent Calendar, the gift being revealed each day in the run up to the event one of the many barbed comments McGregor had fired Aldo’s way. The last one, on the 12th, proved to be the most prophetic of all. I also rewrote the lyrics of a different festive favourite for each day with the fight (and the Irish fans who do like a sing-song) in mind. 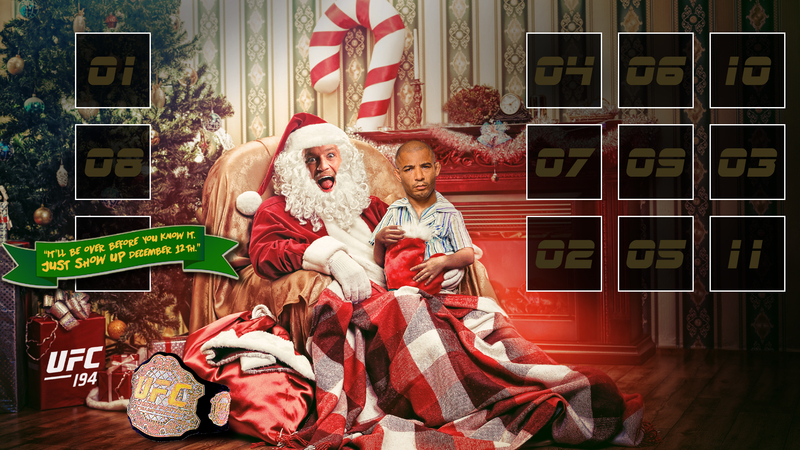 See the rest of the calendar, still online in all its festive, post-win glory here.